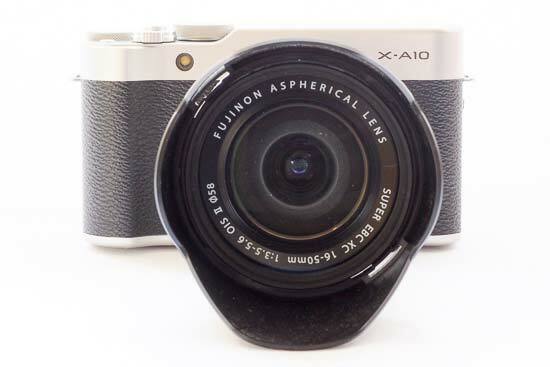 The Fujifilm X-A10 is a new interchangeable lens camera which sits at the budget end of Fujifilm’s X-range. The “A” in its name denotes that it’s in the beginner line-up, with it sitting below the X-A3. This camera is available as a cheaper version of the X-A3, and as such, the specifications aren’t quite as good. It features a 16.3 megapixel sensor, compared with the 24 megapixel device of the X-A3. 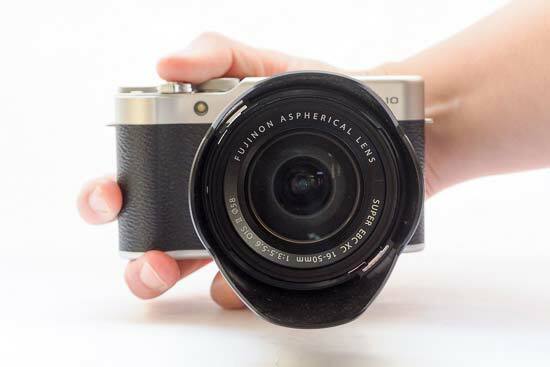 It features the Fujifilm X mount, and is available to buy as part of a kit with the XC 16-50mm f/3.5-5.6 kit lens. This is a cheaper kit lens than the 18-55mm f/2.8-4 lens you can find with Fujifilm’s more advanced cameras, like the X-T2, but it’s the same one you can buy with the X-A3. Other features include a tilting screen, which, in another difference from the X-A3, is not touch-sensitive. There’s also no hotshoe for attaching external accessories, but there is an inbuilt flash. Inbuilt Wi-Fi, Full HD video recording, and manual and semi-automatic exposure modes round out the specifications for the X-A10. The Fujifilm X-A10 is available to buy for around £499 / $499, including the 16-50mm lens, making it around £50 cheaper than the X-A3. 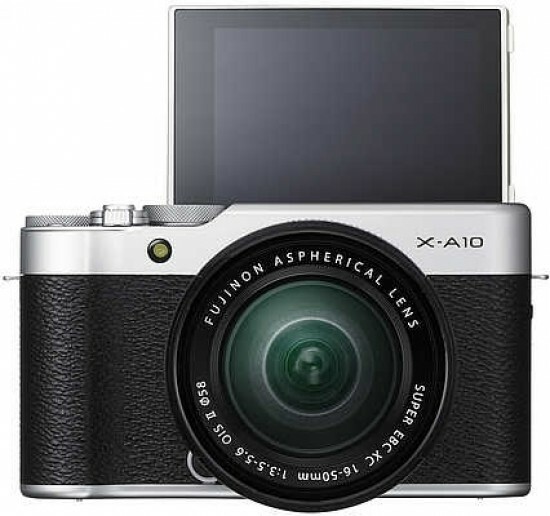 Outwardly, the Fujifilm X-A10 shares the same kind of look as other cameras in Fuji’s X-range of cameras. That means it has retro styling, especially if you go for the silver and black version we were provided for review. The feel is a little cheaper though, being a touch on the plasticky side, giving away that this is a model designed for entry-level users and is on the budget end of Fujifilm’s scale. The body of the X-A10 is small, and we’ve been using it with the XC 16-50mm f/3.5-5.6 kit lens. The overall look is arguably a little unbalanced, especially when the zoom lens is zoomed to its full capacity. There’s no viewfinder on the top of the camera, which may have helped to create a better overall balanced look. Unlike with the X-A3, Fuji’s other entry-level mirrorless camera, there’s no hotshoe on the top of this camera. That means if you like viewfinders, there’s no option to add an optional one. There’s also no way to add other accessories, such as a flash, highlighting the intended beginner audience for this camera. On the top of the Fujifilm X-A10 is a mode dial which features the different exposure options available. This includes a range of automatic and scene options, as well as full manual and semi-automatic (aperture priority and shutter priority) modes for those who want to make more advanced changes. Also on the top of the camera is the on/off switch, which surrounds the camera’s shutter release. There’s a reasonably large dial which controls different functions depending on what you’re doing with the camera. For example, if you’re in aperture priority, it alters exposure compensation, but if you’re in manual mode it adjusts shutter speed. It’s also used in playback to scroll through your images. A customisable small function button is found just in front of the dial. You can assign a variety of functions to this button, depending on what you see fit. By default, it controls ISO in shooting mode, and accesses the Wi-Fi settings in playback. 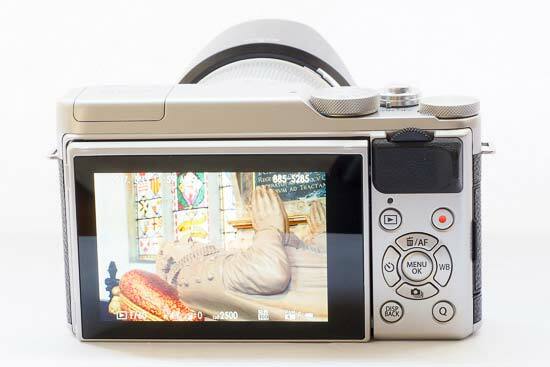 The Fujifilm X-A10’s inbuilt flash is housed on the top of the camera, with a switch at the side to raise it from the body of the camera. Because of its position, if you’re using the 16-50mm kit lens, especially with the lens hood, you might find that a shadow is cast on your images. You can help to reduce that image by zooming in to the subject, and removing the lens hood. 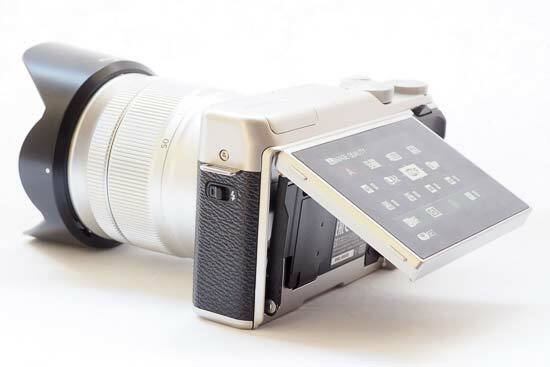 Flipping to the back of the Fujifilm X-A10 and you’ll find a tilting LCD screen. This can face all the way forwards, and pulls out from its hinges so you can have a clear view of the whole screen. It’s ideal for selfies, and the view flips over to be the right way up when facing forward. When you face the screen forward, face detection automatically switches on and the focusing will look for faces and eyes. Unlike with the X-A3, the screen is not touch-sensitive, which is a shame. All of the X-A10’s buttons can be found on the right hand side of the camera, which makes it simple to change settings when holding the camera one-handed. There’s a small scrolling dial found just above the thumb rest, which like the larger dial on top of the camera changes function depending on what you’re doing. In aperture priority, it allows you to change the aperture. Underneath this dial we have a fairly familiar set up. There’s a four way navigational pad, with each of the buttons having a specific function assigned to it. Down controls drive mode, left activates the self-timer, right controls white balance, while up is used to access changing the AF point. You’ll need to do this since there’s no touchscreen or joystick to give you direct control over AF point. In the middle of the four-way pad is a menu button, for accessing the camera’s main menu. A Q button gives you quick access to a range of commonly used settings, saving you having to delve into the main menu. Here you’ll find options such as ISO, film simulation, image quality and more. You can customise this menu to add or remove functions as you see which, depending on what you use most or use least. The final three buttons are a playback button, a video record button and a display button. On the side of the Fujifilm X-A10 are mini HDMI and micro USB ports. The battery is charged in-camera, via the micro USB cable which is supplied in the box. The battery and memory card slot are found in the bottom of the camera, guarded by a hinged door. Inbuilt Wi-Fi is included for the Fujifilm X-A10, with a free companion app for Android and iOS. The camera connects very quickly with a phone, and the app is extremely easy and quick to use. You can transfer shots over to your phone for quick sharing online, as well as take control of some key functions - that could make it useful for group shots and so on. Autofocusing speeds are quick when using the Fujifilm X-A10 in bright light. In lower light conditions, the camera takes a little longer to acquire focus, but it’s extremely rare for a false confirmation of focus to be displayed.